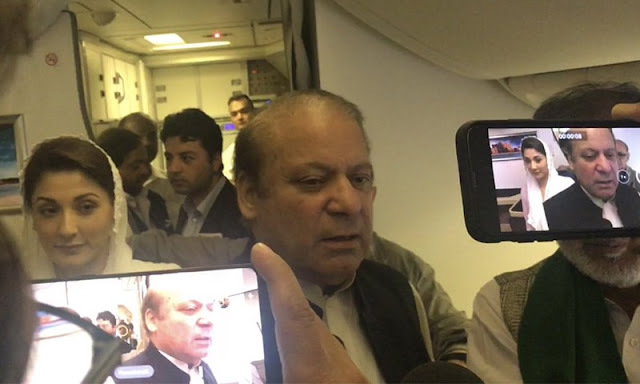 The flight conveying former president Nawaz Sharif and Maryam Nawaz arrived at Lahore's Allama Iqbal International Airport around 8:45pm PST on Friday night, and the two were arrested by National Accountability Bureau (NAB) authorities around 9:25pm. As per media reports, many security authorities entered the plane after it landed and requested that different travelers take off. The pair's passports were seized by a three-member Federal Investigation Agency (FIA) group. Soon after, the two were arrested. Nawaz and Maryam at that point boarded up a little private plane destined for Islamabad International Airport (IIA). The flight has left Lahore. After arriving at IIA, Nawaz and Maryam will either be traveled to Adiala Jail or headed to Attock Jail. 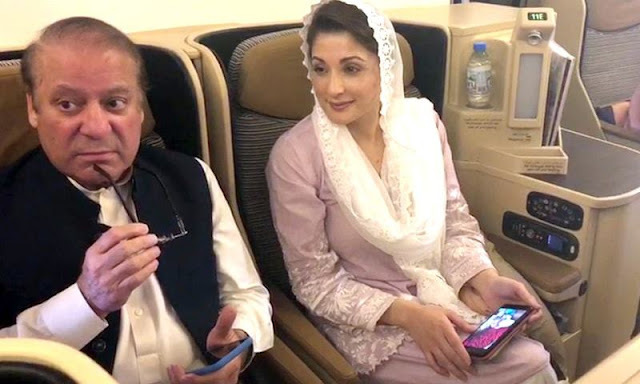 Nawaz and Maryam were indicted by a responsibility court in the Avenfield case reference last Friday and gave imprison sentences of 10 years and seven years separately. The previous was discovered blameworthy of owning resources past known pay, while his little girl was indicted for supporting and abetting her dad in concealing a "scheme". After the decision was reported, Nawaz and Maryam had said they would come back to Pakistan and advance against the choice. The National Accountability Bureau (NAB) and Punjab governments had made game plans to arrest the dad little daughter twosome upon entry. Their flight home took off from Abu Dhabi around 5pm nearby time and arrived in Pakistan at around 8:45pm PST.